About two weeks before the holidays, a sweet-looking case of tools showed up to the Toolmonger shop accompanied by our good friend and Stanley Santa, Jimmy Addison (who some of you might remember from the Break S@#t week demo we did a while back). Under his arm he carried a black chrome socket set. We couldn’t wait to play with them. Saying that I’m a fan of chrome tools is a bit of an understatement — I’m drawn to them like birds to shiny objects. 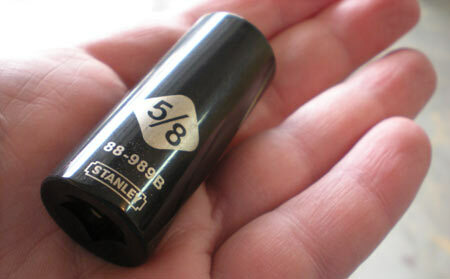 Since Stanley’s black chrome socket set is both awesome-looking and shiny, it’s a win all the way around. I’d never had my hands on a set of black chrome before, so we decided to do what we always do in such cases: beat ‘em up and use them. Getting the box open was a little more fun than we thought. It’s a DIY type of affair. 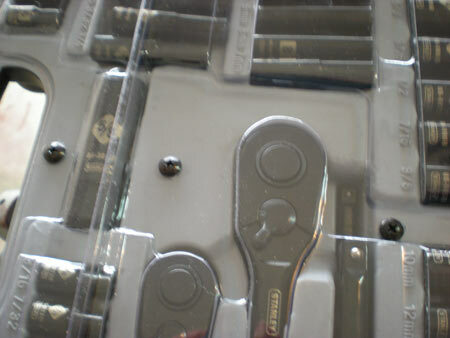 To more clearly show what you’re getting, about a dozen screws hold the plastic shield over the sockets. 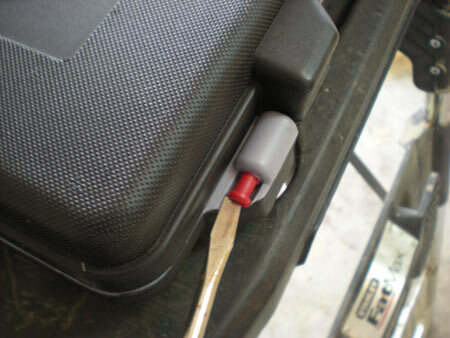 After removing the shield you need to attach the top of the case together at the hinge with a screwdriver; a push to the red pins and you’ve just assembled your box. It may sound strange, but to get the full effect of the black chrome you really need to see them in person; a photo just doesn’t do it justice. Around the Toolmonger shop we very much appreciate sturdy, molded cases. Mechanics tools don’t have a pleasant life in the shop here, so any extra protection is a welcome thing. The biggest advantage to the black chrome (besides looking nice) is that the black sets off the large gold etching so much you can read it about 5 feet away. It’s a huge advantage over squinting and reaching for glasses. It’s also metric and SAE, so it wound up going with us wherever we were just because you have a good shot of having all your bases covered. It wasn’t really surprising that we liked the ratchets since they were the regular Stanley mechanics ratchets dipped in black. They are the solid, easy-to-handle, old friends we’ve come to depend on over the years. 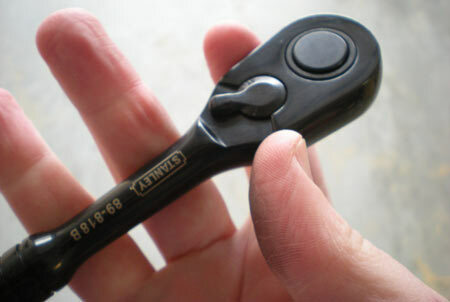 Once in service, the black chrome was as at home as any other tool in the shop. Changing plugs or just turning the odd bolt or two the 69 piece set went where the jobs were — and they were many. 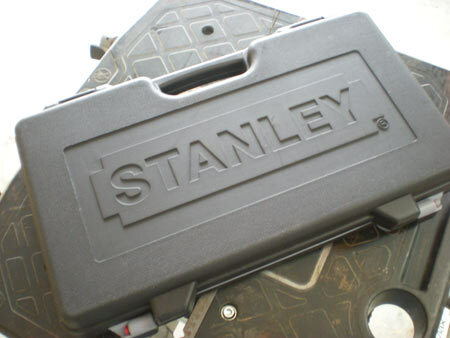 In the end, the black sheep of Stanley’s mechanics tools is more a matter of taste than anything else. They function just like any other set of sockets and ratchets, and except for the color difference they’re the same tools you’ll find wrapped in standard chrome. There’s an old saying that, with all things being equal ($65 for either version), go with the one that looks better. In the case of silver or black and gold, it’s a tough call. These look great but I can imagine getting pissed off if you drop a black socket down the collection of black plastic covers and undertrays on modern cars. Least if its shiny chrome you have half a chance. Lol, true enough Jaxx, the “NOOOOOOOOO!” would be heard from miles around. I love the look, but finding a black socket in a car or on my shop floor (black foam) would be frustrating with my eyesight. Looks exactly like the Home Depot “Husky” set that I bought. Stanley must rebrand them under the Husky name. Plus you get a lifetime warranty on it. Keep the racist comments to yourself. Yes, jobs are everywhere but here in the states, but take the opinion somewhere else. The last comment I read of yours on a different post I believe was ignorant. Got something to say about the TOOL itself, that’s cool, but the off topic comments can be left out. I like the black chrome on these tools are quite nice, and I agree that the finish in person is way better than the pictures let on. The ratchet has a good feel to it, and it’s a great basic set. I think that dropping a socket in the grass at night would definitely be a pain. As a professional diesel mechanic, I always laugh when I see these black sockets. I think Stanley does this fully knowing you’ll lose half the set within a short period of time. What I wouldn’t give for a fluorescent orange chrome! On a related note: here’s a great link about who makes what tools for whom! Having dropped a few sockets into the grass at night, I admit I fear the black finish for that aspect, but I do like the way it makes the size so easily visible. I don’t think that article is entirely accurate. Especially, in regards to Snap-on manufacturing Kobalt tools. At one time a subsidiary of Snap-on, J.H. Williams produced some hand tools for Kobalt. They now no longer do. I believe it is now a subsidiary of Danaher, Armstrong Tools that produces tools for Kobalt. Interesting info on the Big 3 tool makers. Thanks for the link. 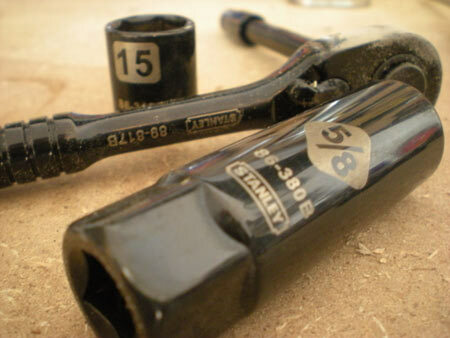 i have nice set of Black colored sockets and wrenches, I only have a few of them left. Most of them either I left them under the hood or just lost them. Gotta admit, the stealth factor of these tools is something that never occurred to me. Unfortunately that link is way out of date. SK divested itself from Facom a few years ago, and Stanley bought Facom recently. The link is not worth visiting. Thanks for the post though. I was under the impression that black sockets could be used on air tools but chrome sockets were only to be used with hand tools. Is that still correct? If so, does the fact that these are black chrome create some confusion? Confusing black chrome for a black oxide finish. You should only use IMPACT rated sockets on air tools (or electric impacts) Not all black tools are rated for impact use. Black oxide coatings have a flat not glossy finish like black chrome. Chrome would flake off an impact socket. I have had the Husky version of this toolset for several years… Maybe I am just luck, but I still have every single one of them – absolutely no problems with losing them in “the blackness”. Actually, since virtually every other tool that I own is chromed, the black finish actually makes these easier to spot when I have a bunch of tools all over the workbench. My dad has this set and its a very nice set and very reasonably priced, with the black finish separating it from hundreds of other similar sets. when I use it, I always end up with black stuff on my hands (from the tools, not from the grease), and the more common sockets and ratchets are starting to lose their finish. Not a big deal, but they do rub off. How are sales of these going? Are people being put off by the colour and the vulnerability of losing them quite easily?! They look good, but practically as others have commented, they have the potential of getting lost fairly quickly. I think LennyNero got it right, Stanley are selling these sockets as a marketing plan so that people have to go out and buy another set in 6 months time when 69 pieces is down to 10! 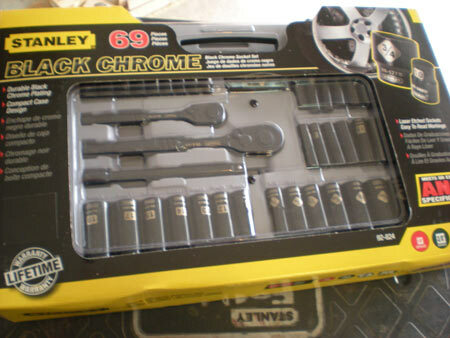 I am taking my black Stanley set back to Canadian Tire because it’s rubbing off in my hands. The reason I bought the set was because I’m allergic to nickel. However, my hands were stained black from touching them. The Stanley rep said the Chinese manufacturer said that it is a mixture of “black nickel plating and wax” that coats the black tools. Yuck! I informed the rep that 1 out of 5 mechanics were allergic to nickel, and that Stanley should do something before they have a class action lawsuit on THEIR hands! Wow. I was thinking of buying some black chrome sets for people for Christmas because they looked so sharp. Is the black really a wax based formula? Sweaty hot hands would definitely make the wax soft. No wonder the color comes off in your hand. I think I’ll give some HI-VIZ highly polished chrome vanadium steel sets for presents. They have have a band of red marking them. Makes them real easy to see when you drop them even if they roll off to some bizarre place. If I drop a socket in my garage it took me for ever to figure out they rolled out and on to the driveway because of the pitched floor. They go like 12 feet,and I was looking around where I was standing not out on the drive way. Just dumb luck I found them, my sets not HiViz. Don’t know what Paul and mrfixitrick are talking about, but the Black chrome finish is as durable and permanent as regular chrome tools, at least from my experience. 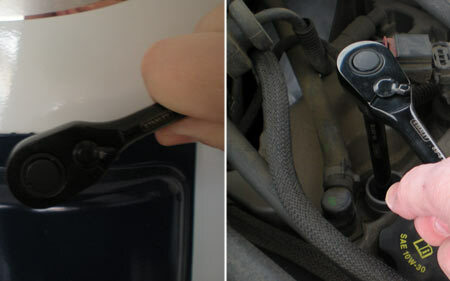 I’ve been using a small ratchet + socket set of that series for about a year now with some moderate use (a few times a week), and aside from the usual wear that occurs to all tools (very small dents and scratches), nothing is peeling or rubbing off. Overall a great set for a very good price, I’ll probably buy more of their tools from this series.